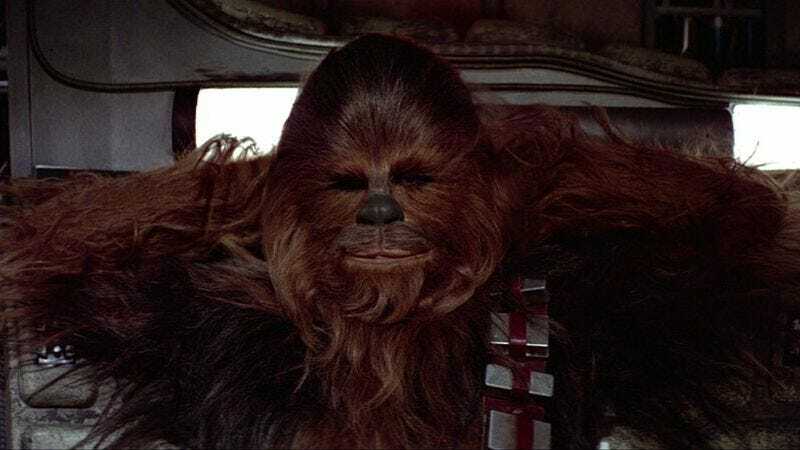 After Chewie turned up on last year's Black List of the best unproduced screenplays, we mused on the unlikelihood of the film ever getting made, given that it tells Peter Mayhew's behind-the-scenes story of Star Wars—a property that George Lucas doesn't like being exploited, unless it's Lucas doing the exploitin'. But there's actually a fairly good chance of it happening now that director Kyle Newman is involved, given that he successfully got Lucas to sign off on his first Star Wars-themed comedy, Fanboys, by ensuring that his film was 90 minutes of worship without the slightest hint of negativity about the object of its obsession. Of course, so far Newman has only secured Mayhew's life rights to dramatize the tale of his working as a hospital orderly while donning a Wookiee suit in his off-hours, and Lucasfilm has not as yet given his official blessing on having any actual Star Wars stuff in this Star Wars movie. But given that Newman has already proved his undying loyalty, it seems likely that Chewie won't have to be retitled Very Tall Space Dog or whatever.